AgWeb’s Crop Comments allows farmers across the country to share their planting progress, crop conditions, farming issues and more. Recently, an east-central Iowa farmer submitted a picture of what he calls “ugly stage corn.” Another farmer suggested that perhaps his corn isn’t getting the full benefits of the nitrogen that he applied. Ken Ferrie, Farm Journal Field Agronomist explains that nitrogen-deficient corn in the beginning of the growing season gives up yield potential, whereas, corn that’s nitrogen-deficient late in reproductive stages gives up actual yield. “You want to keep enough nitrogen available during all corn growth stages so crop growth never slows down,” Ferrie says. 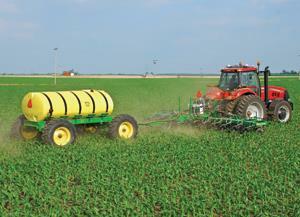 Shop Agrimart for all of your Nitrogen Application Needs.